Backyard gardens in Jablonec — where the majority of our Czech beads and buttons are made individually or in small batches by traditional artisans– are not orderly cages of color meted out in practiced and precise intervals. Maybe because the soil itself is likely to be dotted with colorful pieces of broken and discarded beads strung in the yard on sunny days by various folks over the last century or so — Czech gardens are full of color and surprise. Shanti has been echoing that fresh spirit within her choices for traditional Czech shapes like bells, leaves and daisies for several years. 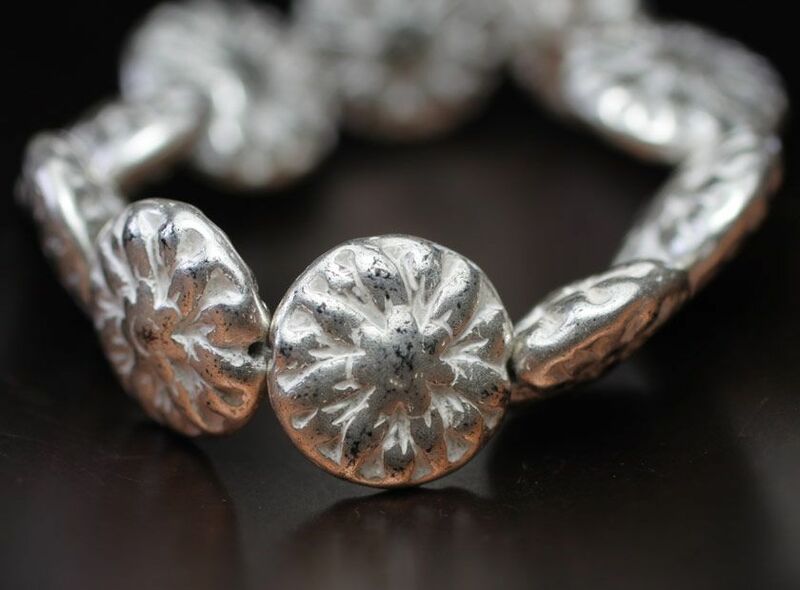 But last year she discovered a long-dormant mold for the coin-type bead now known as the Dahlia and it has quickly emerged as a blooming favorite by Nirvana Bead artists everywhere. The strength of the Dahlia is not one set of strong characteristics, but its’ chameleon-like ability to work in so many types of beadwork design. It’s simple 14mm round, single-hole symmetry make it an easy choice of bead-weaving and stringing bringing new life and excitement to familiar patterns and stitches. The delicate ridges of the petals on each face give it texture and drama, but the relatively flat profile brings it easily into embroidery. Alone on a ear post, hanging from a chain at the neck, or anchoring one end of a delicate necklace or bracelet it gracefully moves into in the position of a Czech button. Bezel it and it serves as a solid center of possibility. Our transparent /mercury glass design looks as light as a gossamer feather while the stone picasso appears almost primitive in its’ own rough beauty. Ocean blue with turquoise wash takes you right to the shore, while the amber with mercury glass feels like a deep Baltic forest. 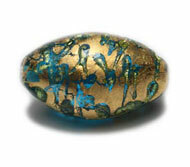 The same basic bead delivers a dozen new possibilities with every new combination of color and finish. Response to our first experimental run was so good, we expanded to 16 combinations as fast as Shanti could grow our garden — careful to respect the unique qualities of the newest old Czech bead out today. The response in orders and comments from our customers demanded more choices. The Dahlia is now clearly rooted in the new century, but the challenge to continue to build on the winning color and finish combinations escalates with each expansion. See our account of that it takes to bring a new design to market. 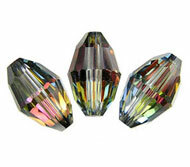 Ten new colors arrived from Jablonec last week as dazzling as any backyard garden there. Our artists own the molds and are likely to be producing Dahlias for others soon. We are proud to have helped them re-introduce the traditional design and build business with them in an economically challenged industry. Your response supports their continued work as well as ours. You asked us for more and we’re delighted to deliver. We’re so pleased the latest, we’ve already asked Shanti for more.